After the indoors early in 2017, Aidan was still a new junior driver who needed a lot of growth. We as a family decided that the racing goals for 2017 would be about developing our young man not only as a driver, but as an athlete who works on the mental and physical game, a student of other interests and last but not least, an individual with character and sportsmanship who earns respect. 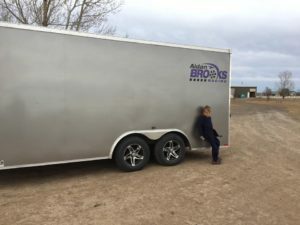 With these intentions, we started training with Kelly Jones at Race Craft 1 Motorsports Training. We started club racing in May with a lot more maturity and had success although Aidan was still chasing the elusive top spot. Region 8 drivers provide a lot of quality competition! With each race, we saw Aidan grow…this little racer is tenacious, smart and calculating! We were fortunate enough to travel and race some big venues! 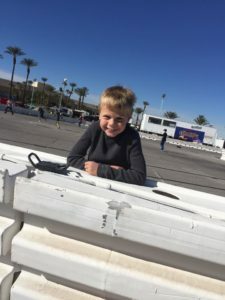 The Eastern Grands, The Battle at the Brickyard, Rocky Mountain Fall Nationals, PPIR Hot Rod Rock and Rumble and Silver State Winter Nationals! When asked, he couldn’t decide what was the #1 highlight of the 2017 season so here are some of the choices! ~Grandma (Maureen Belsito) getting to see me race a lot! ~My first Junior win with the Animal at PPQMA! ~Battle at the Brickyard~he loved the whole thing! The Honda was in the A main and the Animal was the X car for the A. ~Double up with the Animal and Stock at Rocky Mountain Fall Nationals. ~Double up at PPIR with the Honda and the Animal. ~The 3rd place podium at Silver State Winter Nationals in the Animal with a heat win to get there! Aidan also raced 4 cars at Winter Nationals! He and Daddy were pretty tired! We added a LGT 160 to the fleet! Wrapping up the 2017 season and looking forward to 2018 (stay tuned for details!) with gratitude that we could make this happen and to those who helped us do just that! Our sponsor Jake Stone Electrical, Inc.
Our stiff Region 8 competition that keeps us on our game always! The many competitors and mentors who offer advice and encouragement every weekend! Heat races are on Friday! We get practice tomorrow. Lower mains will be Saturday and A mains Sunday. If we are racing on Sunday, we have had a good week. Over 30 cars registered for Aidan’s Jr Honda and Jr Animal classes. Fewer cars in Jr Stock but a much more challenging class for drivers and Daddy getting the car set up! Mother Nature decided to mess with our plans so we decided to leave early! Off we went this afternoon on our way to Las Vegas! It was a yucky drive through the mountains but we are west of trouble and going to stop for the night! 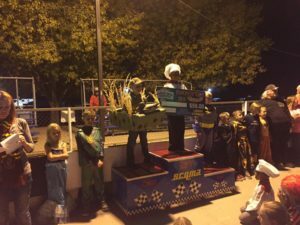 Batman is on the podium at the Pumpkin Race! It was a solid day of racing at SCQMA in Pueblo! Aidan came thru his heat and into the B main. He finished 3rd in the B main earning a spot in the A main and ended up finishing 3rd! There were 12 starting Jr Hondas in total. Everyone was happy with the finish. all drivers got goodie bags, a pumpkin, games & trick or treating. It was a great time! 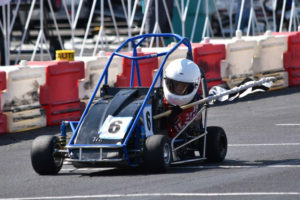 The last race of RMQMA’s season was this past Sunday. Moving up divisions has been challenging and Aidan has had some growing pains, but shows a lot of promise! We have an SCQMA club race planned for next weekend– then stay tuned for as we plan our trip to Silver State Nationals the week after Thanksgiving!